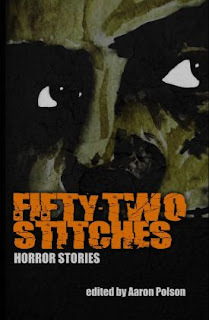 I’m sure I don’t need to remind you, but I’m going to anyway: Fifty-Two Stitches is available for pre-order right now. It’s packed with great stories and has a very creepy cover courtesy of Aaron Polson - is there nothing this guy can’t turn his hand to? So, what are you waiting for? Don’t waste your time reading this nonsense, head on over and place your order. You know you want to. As soon as I get my copy, I’m going to sign it, auction it on eBay and buy it back myself at an extortionate headline grabbing fee in the perverted hope that it raises my pitiful profile. a tricky mind you have there, LR. A surefire plan! That plan is so cunning you could brush your teeth with it. Rebecca – I like your style; it’s a deal. Samantha – It’s a winner, there’s no doubt about it. Aaron – I second that whoot! Mike – Normally I’d agree but the path of my life is strewn with cowpats from the devil's own satanic herd, so who knows?